The Golden Palace, a spinoff of the Golden Girls, is coming to Lifetime television. Cheech Marin stars as Chuy, the wacky cook. This show lasted one season and hadn't been seen since. It airs at 6:30PM EST beginning August 1st. The infamous Bobby Capps is back. This time he managed to piss off his neighbors by putting a message to Cheech and Chong on his house. Capps' reaction, "SMD." In related news, Bobby is currently working on the film Thunder Mike and Rumble Rob. Capps wrote and stars in this independent film about renegade bikers, gold, music, tragedy and survival. It's a great script and promises to be an even better film. On September 25th and 26th, Cheech Marin will be attending CVS Newport Under The Stars, a benefit for Boston's Joslin Diabetes Center. The benefit, which takes place in Newport, Rhode Island, is being organized by Cheer's John Ratzenberger. Also attending are Tony Shalhoub, Jason Bateman, the cast of That 70s Show and lots of other celebs. Hey, it is a toothpick. 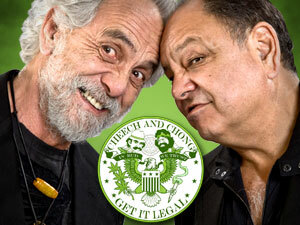 The infamous Cheech Marin turns 59 today. Cheech was born July 13th, 1946 in Los Angeles, CA. Pittsburgh Live has an article about Mary Beth Buchanan, the Bush-appointed U.S. Attorney for the Western District of Pennsylvania. She and Ashcroft were responsible for framing Tommy Chong. Ashcroft once referred to Buchanan as his "boss." Photos have been posted of Tommy Chong's daughter, Rae Dawn, at the opening of Tommy Lee and Dave Navarro's Rokbar.